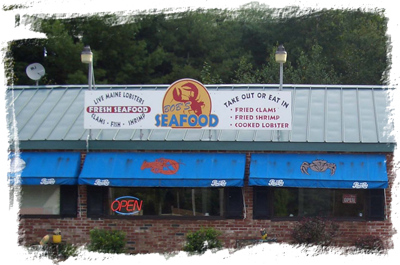 Bobs Seafood is "The Total Seafood Store" located in Windham, Maine just a crab walk from the coast. Although this location started in June of 2002, Bob's is family owned and operated and has been working with Maine and imported seafood for over 30 years. What do we mean by "The Total Seafood Store"? We not only sell an assortment of fresh sea products from the coast of Maine, we operate a take out restaurant here as well. ( We provide rustic seating inside and out, so you dont have to take your meal too far! ) You might be looking for us to ship you lobsters right now, but don't forget when you are in the area, that we know how to cook as well. Quality is our trademark, served up with prompt friendly service. We want a first time customer to be a life long customer. Having the experience allows us to select the freshest lobsters, clams, fish and a variety of other seafood from the local waterfront daily. It is these products that will be delivered to you; from the sea to you via UPS. Fresh when we pick them up, fresh when we pack them and fresh when you get them. We pride ourselves on our quality seafood. Maine lobsters, native steamers ( clams ) and cultivated mussels are just a sampling of the tasty treasures from our Atlantic waters. You know it doesnt hurt being Maine Natives either. We know how to talk to the local Fishermen. You can't just go get lobstahs from anyone. Would be hard making chowdahs without steamahs too, wouldn't it? Special orders don't upset us. We have been known to ship red hot dogs or Maine Italian sandwiches out with a lobster order upon request.